Chuck Jones (director) and Michael Maltese’ (writer) ONE FROGGY EVENING has one of the lamest titles ever stickered to the front end of a cartoon, but it’s an undying masterpiece just the same. Of its many striking qualities, its uniqueness is a major one — it isn’t like anything else Jones, or Warner Bros, ever attempted. Since I learned in school that you can’t have levels of uniqueness — something is either unique or it isn’t — the peculiar feel of this film must be attributed to its being unique in multiple ways, surely? It’s wordless. While Hanna & Barbera at MGM were happy to go mute with their Tom & Jerries, but Warners cartoons enjoyed the verbal element, even if the scripts depended less on wit than on speech impediments and abrasive accents. But Jones also made FEED THE KITTY, in which both main animal characters are non-verbal, and the Roadrunner/Coyote series, wordless save for the infinite supply of labelled crates and instruction manuals from the Acme Corporation, and the equally infinite supply of hand-written placards, suited to every occasion, which Wile E. can produce from the limitless expanse behind his slender back, as required. So wordlessness can’t be part of OFE’s individual spark, can it? 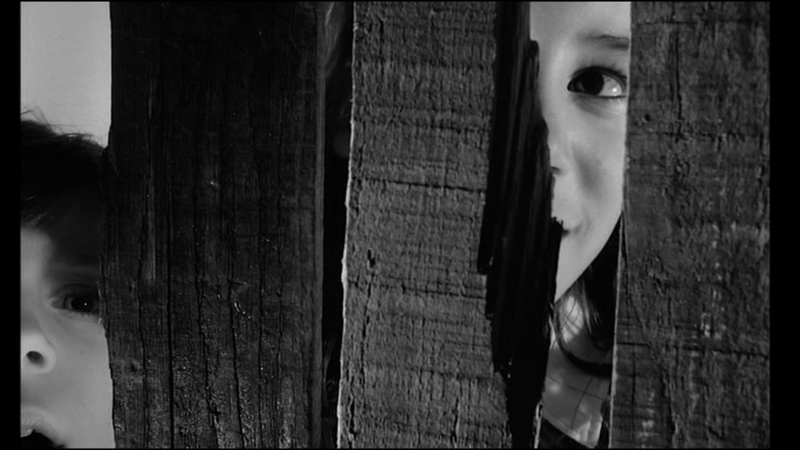 But there is a particular quality to the silent-movie approach in this one. The frog sings — the humans make no sound. This inverts the pattern of FEED THE KITTY which, with unusual realism, featured a talking housewife and a bulldog and kitten without the gift of language. The fact that the many words heard in OFE are lyrics, sublimely irrelevant to whatever situation they’re sung in, adds a further absurdity. Jones began his cartooning career with an obsessive quest for cuteness and sweetness, which the raucous atmosphere of Termite Terrace eventually exorcised from him. He could still access it when appropriate, but it would now be leavened with more abrasive elements — FEED THE KITTY is very sweet-natured, on one level, but scores its biggest laughing sequence with the cruel jape that the big dog thinks his feline friend has been diced up and baked into cookies. It’s maybe the one film that can make me laugh and cry at the same time. But OFE is set in a world without sweetness. A seemingly contented demolition worker discovers, sealed within the cornerstone of a building he’s razing, a singing frog. He’s convinced this will make his fortune. But the frog sings only to him. All his attempts to monetize the amphibian result in his gradual destruction — humiliation, bankruptcy, homelessness, incarceration. Finally he deposits the frog within a fresh cornerstone, all set to ruin some poor workman of the future. Like Polanski’s TWO MEN AND A WARDROBE, OFE revolves around a central conceit which refuses to define itself. Neither symbol nor allegory, Michigan J. Frog, as he was eventually christened, remains his own man. It’s interesting to enumerate things he might represent, but his dumb, croaking face stares blankly at us (like Hypnotoad!) as if to dumbly insist that he’s just a frog. When he sings, a Jekyll/Hyde transformation overtakes him, and he is 100% singing! 100% dancing! No thought creases his green brow, the music just pours out of him. I Am A Singing Frog, is his statement during these transformations/performances. He is possessed by some slimy Muse. At other times, not. One explanation occurs to me and rather appeals: the frog as metaphor for Jones’ own talent. Perhaps he felt saddled with a gift which, though special and, to him, important, was not fully appreciated by the rest of the world. Let’s face it, any society where men like Jones, Avery and Clampett are paid less than the president has got its priorities badly wrong. Cartooning was a somewhat low-status job at Warners, though Jones earned a living rather than being rendered destitute by it. But he may have had moments of wondering what good it was to have this talent, when the world may have seemed largely indifferent to it. The nameless demolition man is cursed by his gift as surely as Llewyn Davis in the Coen Bros film. Frog or albatross? Of course, there’s the Freudian angle, and you know I’m going there. Michigan J. Frog as performance anxiety. The damn thing works fine when I’m alone, springing to its full height and putting on a show. As soon as I try to demonstrate it to an interested party, it crumples up. I manipulate it by hand, trying to show what I know it’s capable of, but it remains defiantly limp, hanging boneless and shrivelled. I think I’m correct in saying Freud would immediately have diagnosed such a nightmare as having something to do with a body part, perhaps the liver. When I first saw the film, I thrilled to its savagery — the relentless cruelty of the film’s one joke, directed at a character who may, it is true, have absconded with a musical animal which did not strictly belong to him, but who otherwise seems blameless (finders keepers being a well-established legal principle). The point seemed to me simply that the universe was hostile, and would reach out, for no reason, to crush an entirely insignificant man using insanely unnecessary force, for no reason. I felt Jones had stumbled upon a large and important and previously almost unrecognized truth. If there’s a slight flavour of Kafka here, that may be why. Finding a singing frog that, with inexplicable non-malice, destroys your life, is as likely and as irreversible as awakening as a giant cockroach: on the one hand, not likely at all. On the other, inescapable. It always happens and it always will happen. It has already happened to you and to me. 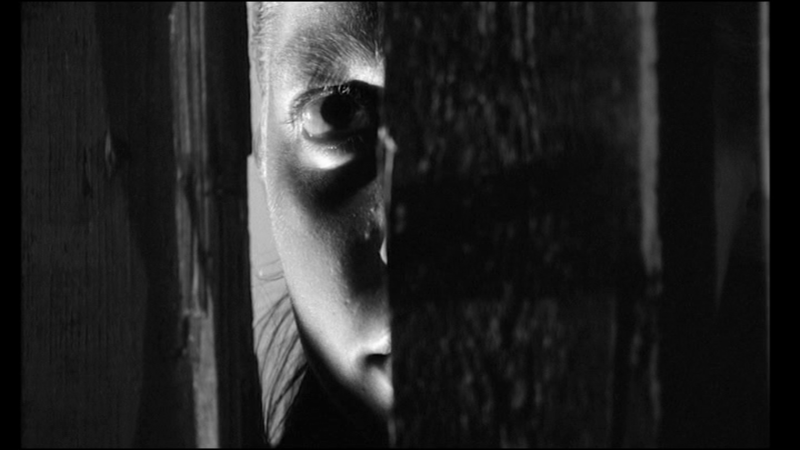 Amazing images from Welles’s THE TRIAL. 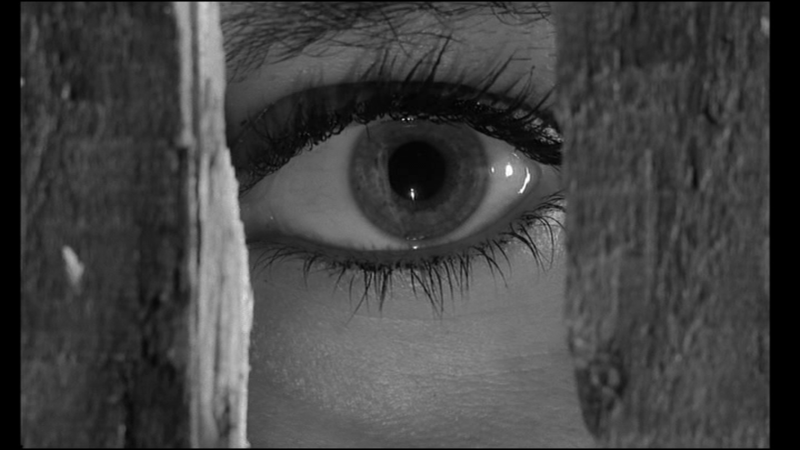 I was in the mood for some Welles, in preparation for a lecture, but I’ve seen all the major ones quite a lot. However, Fiona announced that she had never seen all of THE TRIAL, so that gave me the chance to see it anew, through her eyes. The Canal + DVD is pin-sharp. “You can see Romy Schneider’s little blonde moustache hairs!” exclaimed Fiona. 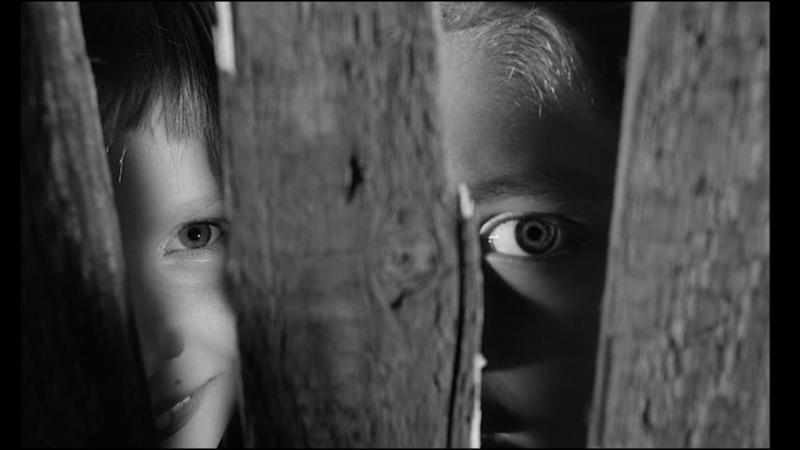 Sharpness is conducive to the film’s dreamlike atmosphere. My friend Colin Cowie, while not really liking the film, did admit it had the best evocation of dream logic, narrative, feeling. “In real life, you can sort of walk around things and say, I see now — it’s not like that at all. But in dreams, everything is –” and he shoved his face right into mine to illustrate the dream-perception problem. Just going through one scene to grab these shots was instructive. 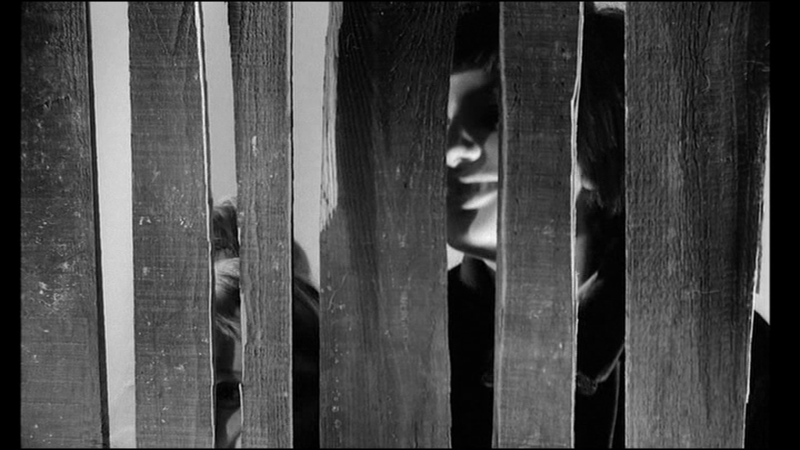 Welles breaks up the longer, wider, sweaty master-shots of Anthony Perkins as K and William Chappel as Tintorelli (voiced by Welles) with tiny snippets of little-girl-staring-through-slats closeups. 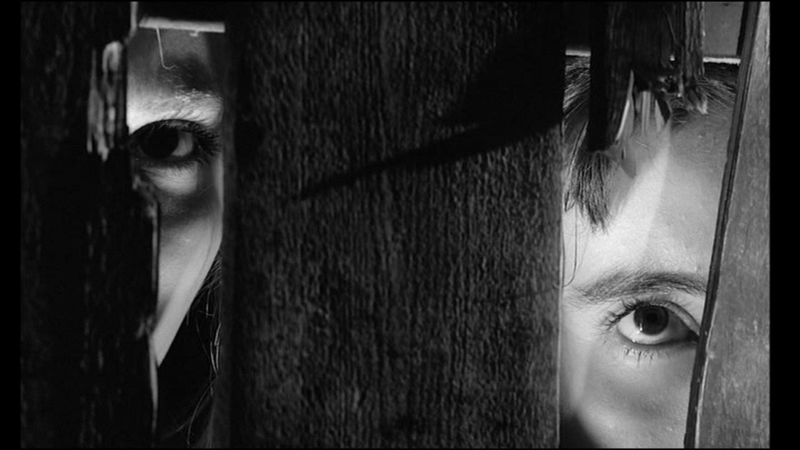 The very brief shots seem to be incredibly numerous — you can tell Welles is occasionally repeating them, but only when I went through the scene to grab images could I see that practically every image is used multiple times, interspersed so that you can’t quite tell. Welles’ experience in magic and his ability to turn economics into artistry and his unwillingness to leave a scene the way it was shot — always STRETCH THE FOOTAGE! — all this is in play here.